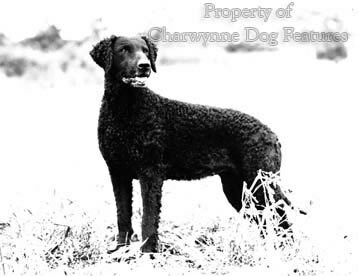 It is probably just as fair to describe the Curly-coated Retriever as the oldest and most under-rated breed of retriever. Their qualities are well known to their owners but are usually untapped by the majority of shooting men. Yet there is something very masculine about the curly, they are a fussless breed and a very individual one, protected from 'mongrelisation' by their astrakhan coats. I once spent a happy day judging working tests just for this breed and found much to admire in their character. A number of knowledgeable writers of times past have become seriously confused by the Curly. Youatt scarcely mentions the breed. The much-quoted Stonehenge wrote that: "Little or nothing seems to be known of the history of this dog...there is no getting at the exact source of the breed...I am led to think that some non-sporting dog, such as the poodle has been used...The general belief is that the water spaniel and small Newfoundland have been used in establishing the breed, and there is little doubt of the truth of this theory." This is quite astonishing ignorance for a writer of his standing. 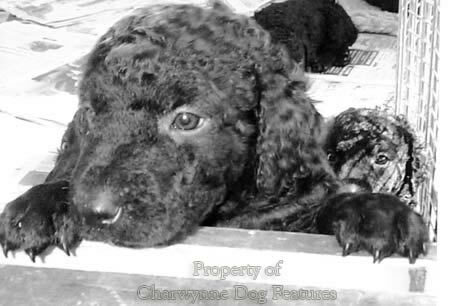 Dalziel, usually so reliable, attributes the curly-coat to the "old close-curled English Water Spaniel" and states that many think the Irish Water Spaniel is behind the breed. The unique astrakhan coat of the Curly, like the coat colours of the Vizsla, the Weimaraner and the Dalmatian, provides an inbuilt protection against cross-breeding; if the astrakhan coat isn't there neither is the breed! This distinction is reinforced by the fact that this is the tallest retriever with a silhouette all his own. Bede Maxwell, in her very forthright The Truth About Sporting Dogs of 1972, wrote on the Curly that: "He is a sober customer in the main, sometimes dour, and with a mind of his own, but a magnificent dog to own...He should not (maybe could not) look like a Labrador in outline, nor a Golden, nor a Flat-Coated. He is all his own dog!" Against these compliments can be placed the words of ‘Pathfinder’ and Hugh Dalziel in their Breaking and Training Dogs of 1906: "I do not like Curlies of any colour. As far as my experience goes, the more the coat curls the more bounce and impetuosity in the dog and the harder his mouth." 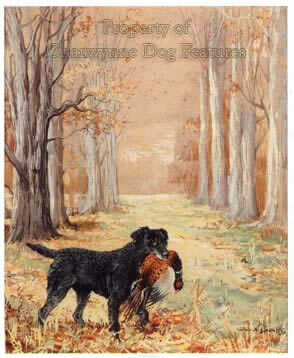 The author's experience with the breed is not revealed but his comments on coat texture are clearly absurd and if curly-coated dogs are harder mouthed than others, medieval sportsmen would have noticed it and it would have been recorded and acted upon. It is therefore worth being mindful of the references we do have of curly-coated water-dogs in medieval times. Despite the long history of the water-dogs, we in England have lost both our English Water Spaniel and our Tweed Water Spaniel. We have failed to acknowledge the ancient origins of our Curly mainly through the ignorance of Victorian dog writers, who so often speculated about an origin for the breed involving crosses between the Newfoundland and the Setter. 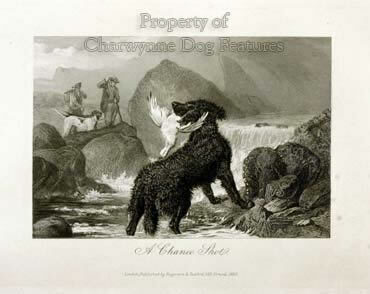 The much-quoted Stonehenge, writing in 1877, described Lloyd-Price's retriever Devil as ‘a curly liver-coloured dog, apparently a cross between the Irish Water Spaniel and the Poodle...showing great perseverance in hunting, with a good nose.’ The Curly-coated Retriever shares a common ancestry with these two breeds but as a type is as old as either. In connection with coat colour, it’s worth noting that only a century ago, Brigadier Lance of Saluki fame, had a kennel of golden Curly-coated Retrievers, but they did not find favour with other sportsmen. This breed has medium size ears: the standard demands rather small ears. The standard calls for large eyes but the breed displays quite small eyes. 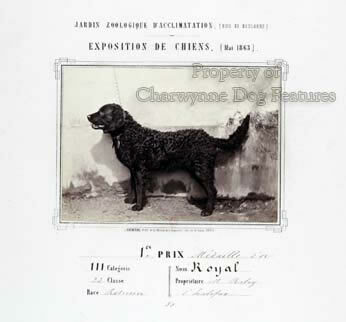 Ears and eyes can typify a breed; the standard should establish breed type. The American Kennel Club standard for the breed is just as misleading on these two aspects but is quite excellent on gait and temperament. A breed standard may not be a blueprint in the true sense of that word, but it should still act as the construction plan for a breed. The KC breed standard does no justice at all to this distinguished breed and needs a radical rewrite - despite its recent review. But whether undersold in its breed standard or underused by today's sportsmen, this is a breed we should be proud of; it is our contribution to the water dogs of the world. LPC Astley, writing in 1907, likened the Curly's coat to the close fitting tightly-curled beautiful head of hair of many native African people, stating that this was the only 'true and proper one...of which every knot is solid and inseparable. A coat of this quality is not capable of improvement by any methods of grooming, for the simple reason that its natural condition is itself perfect.' If you don't lust after the labour of grooming, this is the breed for you!